OTTAWA -- The amount Canadians owe relative to their income ticked higher in the third quarter even as the pace of borrowing continued to slow. Statistics Canada said Friday that household credit market debt as a proportion of disposable income was 177.5 per cent in the third quarter on a seasonally adjusted basis. That compared with 177.4 per cent in the second quarter. In other words, Canadians owed nearly $1.78 in credit market debt, which includes consumer credit, mortgage and non-mortgage loans, for every dollar of household disposable income in the third quarter. Priscilla Thiagamoorthy, economic analyst at BMO Capital Markets, said the health of Canadian balance sheets unexpectedly deteriorated in the quarter. "But unlike in past quarters, the culprit is a weaker income backdrop rather than higher debt loads," Thiagamoorthy wrote in research note. "While the decades-long consumer debt mania is finally easing, income growth now remains a concern, keeping household credit burdens a key headwind to the Canadian economy." On an unadjusted basis, household credit market debt as a proportion of disposable income, excluding pension entitlements, increased to 173.8 per cent in the third quarter from a revised 173.2 per cent in the second quarter. 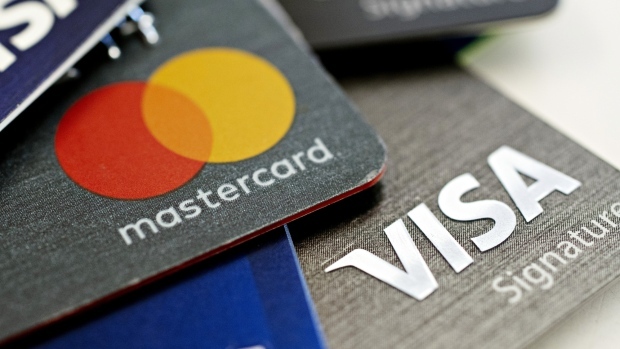 The household debt service ratio, measured as total obligated payments of principal and interest as a proportion of disposable income, was 14.5 per cent in the third quarter, relatively unchanged from the previous quarter. Household debt has been a key concern for the Canadian economy. The Bank of Canada has been watching to see how well households have been adapting to higher borrowing costs as it has been raising its key interest rate target. The central bank has hiked its trend-setting rate five times since the summer of 2017, moves that have pushed the prime lending rates at Canada's big banks higher. "The Bank of Canada appears to be pleased with the progress on the consumer debt front so far, and with debt growth slowing it removes some of the urgency to keep raising interest rates," TD Bank economist Ksenia Bushmeneva said. "The bank may nevertheless want to pause to collect more data to gauge how households are coping with higher interest rates, particularly in parts of the country impacted by recent oil market developments." Total credit market borrowing slowed for the third consecutive quarter as households borrowed $18.3 billion, down from $20.0 billion in the previous quarter. Demand for mortgages posted a third consecutive quarterly decline as they decreased by $1.2 billion. Demand for consumer credit also fell by $500 million, while non-mortgage loans decreased by $100 million. Credit market debt totalled nearly $2.19 trillion in the third quarter. Mortgage debt stood at $1.42 trillion, consumer credit totalled $648.6 billion, while other loans amounted to $112.7 billion.